Is Current “Educational Reform” a Fraud? Why is Cognitive Education Being Ignored? The Thinking Academy –A complete description and manual for how to create an entire school whose focus is on cognitive education as the basis for the curriculum, using Instrumental Enrichment as the cognitive education methodology. The volume includes appendices for details, evidence, and position statements which support the Thinking Academy concept. 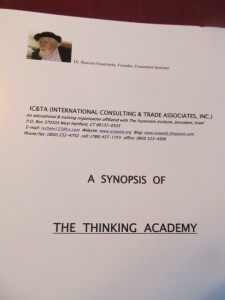 Synopsis–A summary of the Thinking Academy idea, with specific evaluative data from the applications of Instrumental Enrichment to school environments with various populations. The emphasis is on both quantitative and qualitative data which demonstrate the significant positive effects of the program on students, teachers, and parents. 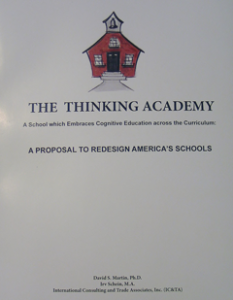 Martin and Schein’s book, The Thinking Academy, is a state-of-the-art proposal for how to transform schools into teaching and learning environments that result in effective measurable, transferrable critical thinking and problem solving abilities for students. Based on Reuven Feuerstein’s ground-breaking work in structural cognitive modifiability and mediated learning (Feuerstein Instrumental Enrichment: FIE), the book demonstrates how to systematically transform teaching in ways that can produce these outcomes with high degrees of success. As well, it offers a realistic, solidly grounded plan for attaining critically important levels of administrative, parent and community support needed for the sustainability of Thinking Academy schools. The book’s target audiences are school leaders, teachers and parents. In this era of accountability, educators are under a lot of pressure to incorporate current research findings in educational and cognitive psychology into teaching and curriculum development. As well, their students need to demonstrate proficiency in cross-curricular critical thinking and problem solving, all of which impacts and reflects on school leaders and parents. 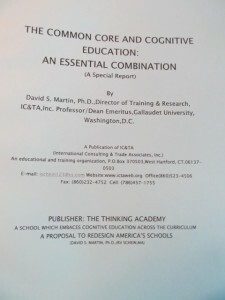 Martin and Schein’s book solidly connects FIE to current thinking in educational and cognitive psychology, which will be appreciated by school leaders, teachers and parents. For instance, there are emphases on the preponderance of evidence for the fluidity of intelligence and its capacity to grow in ways that supersede age-bound cognitive developmental limits proposed by Piaget. FIE teacher training emphasizes thinking through multiple intelligences, direct instruction in teaching specific thinking skills, thinking dispositions, metacognition, transfer of training in and out of curriculum, and instruction-driven assessment methods which are essential in teaching thinking. On another important level, The Thinking Academy is an engaging, empowering model that invites collaborative input and modification in the process of implementation. Common Core –The recent adoption of the Common Core Curriculum Standards by nearly all of the states is a clear trend in American education. However, relatively little explicit attention is given in the Standards to the underlying cognitive strategies which form the framework for all subject matter in the curriculum. 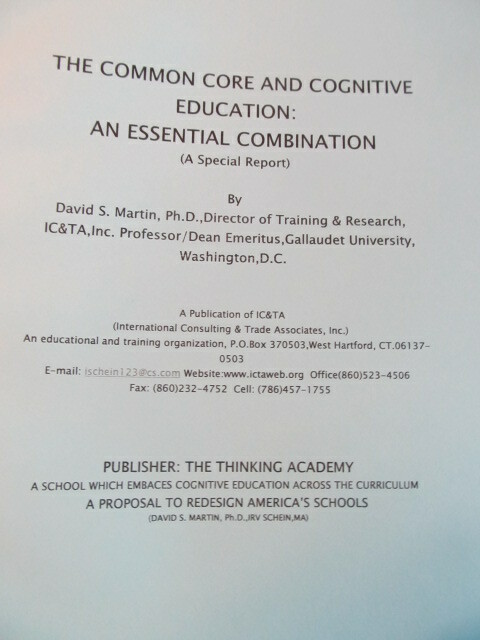 This publication explains that importance and provides specific examples of cognitive strategies which underlie each subject area. 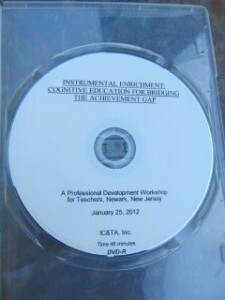 DVD–A video program showing a detailed teacher workshop in the methodology of the Instrumental Enrichment program, based on sessions for teachers in Newark, New Jersey in 2012. Included are explanations of the Instrumental Enrichment program, its history, its method, and its outcomes, as well as video segments showing teachers in action with both the “Basic” and “Standard” versions of the program. Recommended for showing to teachers and parents who are interested in learning some details about the program,prior to initiating training sessions in the program. Check made out to IC&TA, Inc.